If you are what you eat, then biting into a bit of horseradish just might make you better-equipped fighter for sinus infections. 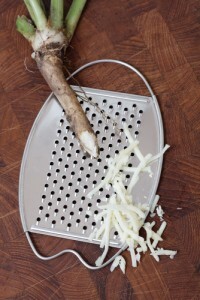 Horseradish, with its high sulfur levels, can help you reduce some of your sinusitis side effects, like mucus buildup. For centuries, horseradish has been used for its medicinal benefits. Specifically, it can help increase facial circulation, help clear the sinus passages and help ease mucus out of the upper-respiratory passages. The ingredient can eliminate thick, stagnant mucus, and in addition, it can help thin new mucus, which can promote drainage. When you feel a cold or sinus infection coming on, consider horseradish for sinusitis. Hold freshly grated horseradish in your mouth until the flavor fades. A pinch should work, but if you need something stronger, work up gradually to about a teaspoon to fight nasal mucus. Once the flavor dissipates, swallow the horseradish to clear mucus in the throat. If your mucus production seems to increase for about a day after trying a horseradish session, not to worry – your body could be ridding itself of the excess while it’s working back to health. When fighting any sinus infection, consulting a doctor is best, so be certain to try any home remedies in conjunction with your physician’s recommendation. We’re always here for you if you need help.